The Centre for Climate Risk and Opportunity Management in Southeast Asia and Pacific (CCROM SEAP) at Bogor Agricultural University (IPB) in close collaboration with the Deutsche Gesellschaft für Internationale Zusammenarbeit (GIZ) GmbH hosted the Directors’ Meeting on 4th October 2013 at Mandarin Oriental Jakarta. 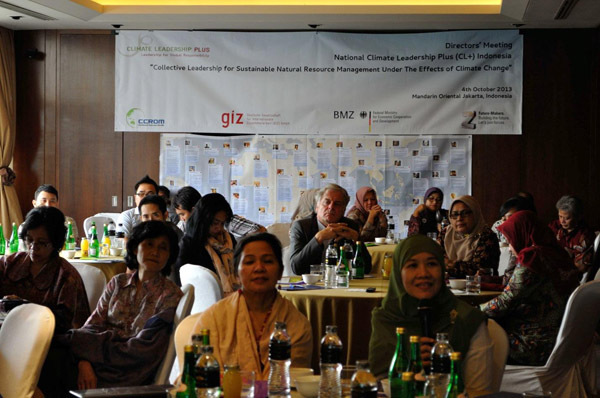 This meeting has a purpose to introduce the National Climate Leadership Plus (CL+) Indonesia program “Collective Leadership for Sustainable Natural Resource Management under the Effects of Climate Change” on behalf of the Federal Ministry for Economic Cooperation and Development (BMZ). The meeting begun with introducing the background, content and objectives of the program as well as leadership tools and methodology applied presented by Prof. Rizaldi Boer, Director of CCROM-SEAP and Heike Pratsch, Senior Program Manager at GIZ Leadership Development Group, Germany. 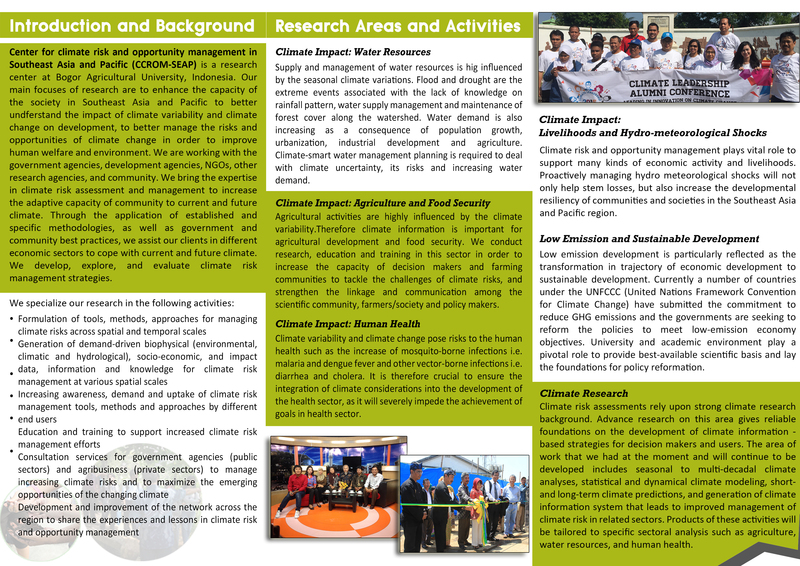 Alumni of previous Climate Leadership Programs (CLP1 and CLP2) were also shared their experiences. Furthermore, Mohan Dhamotharan, expert in the field of leadership development and former international facilitator in the CLP, were shared the exchange lessons learnt and ideas about leadership development. The main intention of the "Directors’ Meeting" is to provide detailed information about the 6-months leadership program to heads of organizations from government, private sector and civil society, relevant for the topic at stake. The 35 invitees are welcome to suggest senior members of their staff for participation in the program. 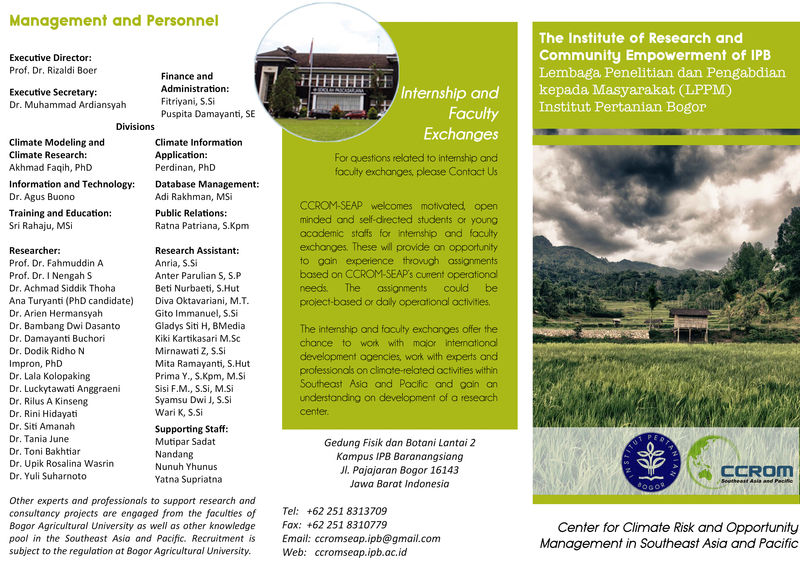 The National Climate Leadership Plus (CL+) Indonesia Programme will be held from January to May 2014 with three 2-3 days workshop sessions and intermediary activities.